I started backpacking around 1994. I started out with 19th century minimalist camping and moved toward more conventional. I backpack anywhere from deep woods, desert, winter lands, caves and river bluffs to urban sprawl, under bridges, abandoned buildings and hobo camps. I also travel a great deal for work as a photographer. Many days spent on the road and air travel, I find most gear and clothing serve that lifestyle as well. I acquire gear over time as I can afford it. My typical pack weight is 30 lb (13.6 k). I've learned through my experiences what gear I need for a lighter pack and a comfortable journey. My first encounter with this pad was at a store where they had a bed of river rocks I used to try out the product. I would not have known I had been lying on rock. Convinced, I purchased the product. I soon visited the manufacturer's website and found very helpful information on care, maintenance and such under their FAQ section. 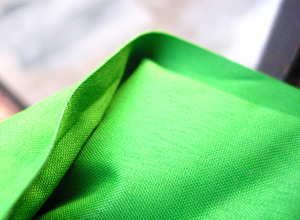 I took notice that the light green color matches the color on the manufacturer's website. 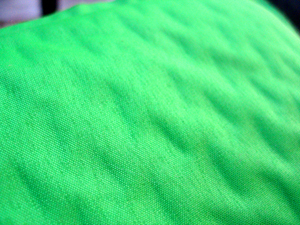 Upon close inspection, I was impressed with the finish and detail. The whole pad looks seamless and has a texture to it that reminded me of a very fine corrugation. Perhaps as a design to stave off slippage. The valve is plastic and threaded and seems cheap and unstable when opened. The cap remains on the valve so there is no worry about misplacing it. When closed it seems very firm. So far, I have had no problems. The pad did not come with a stuff sack. I had to pay extra money for it. I figured it was worth the investment to protect the pad. Also, a repair kit is not included. The first time I used the pad was at my grandmother's house. I wanted to forgo the bed to try out my new equipment in order to get acquainted. After unrolling it, I let it inflate on its own with 8-10 of my own breaths. Most likely because of the product's time with storage and shipping. My next time was a backyard camp. After unrolling, it took some time to "self-inflate". I eventually had to blow in 5 to 6 breaths. I had previously slept on a military foam type and I found the Therm-a-Rest to be far superior to the former. The temperature dropped to 60 F (15.5 C) that night. I slept in a sleeping bag inside a tent. I slept undisturbed and woke up refreshed. The pad had retained all of its loft. I also found that the size was perfect even with my broad shoulders (I am primarily a back sleeper with some side actions throughout the night). It had convinced me enough to purchase another one so my girlfriend and I could both experience the comfort of this type of pad. In May I camped in very rainy weather with the temperature in the high seventies, dropping all the way down to 40 F (4.5 C) at night. The ground was much harder this time. Striking camp this time is where I finally learned how to easily roll up the pad and place into the stuff sack. 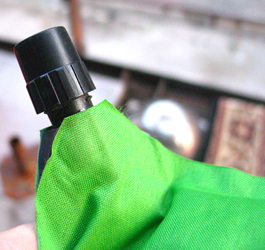 Fold almost in half, open valve, slowly roll up, close valve, hold under arm and slide the stuff sack on. Early June I was camping on the bank of a river- a very rocky riverbank. Temperature was similar to previous test. I used a footprint for the tent and the pad inside the tent. Once again- Didn't feel the rocks. The rest of the camp had set up their tents in another spot away from the river because of this, while the Therm-a-Rest provided me with this prime real estate! Once again, the same results- a good nights rest and same loft in the morning. The next time out had been a car camping night with my girlfriend. We had a 65 lb (30 kg) dog with us in the two man tent. The dog became a nuisance due to trying to get onto the pads so we told him to scram, gave him the boot and made him sleep with the other dog in the tarp tent I erected for them. That night I had engaged in activities some couples might share. While they are designed for rest only and this may seem unnecessary information, I feel it is worth noting as many readers camp with their love interests and may find themselves in the same situation. The pads in the morning weren't as lofty as before and did disrupt some sleep. In the later part of summer, a buddy and I camped in a bluff on hard ground. We slept in open air as we had the shelter of a cliff overhang. I did use the thin military foam pads just to protect the Therm-a-Rest pads. The temperature dropped to 48 F (8.9 C). Unfortunately my buddy had only brought a sheet (what?!). I begrudgingly opened my sleeping bag open so that we could share the warmth. That meant the pads right next to each other and there were probably some rolling back and forth over both pads contending for coverage. However we did sleep fairly well and once again they maintained their loft. Over Labor Day weekend I camped out at a drive-in for two nights. I slept on the pad with a ground cloth over hard packed gravel. I slept very well with a Therm-a-Rest Tech Blanket (a lightweight, quilted nylon blanket with a high-loft synthetic fill and soft polyester interior) as the temperature dropped to 50 F (10C) with heavy fog. I woke up refreshed with the pad as inflated as it was at bedtime. Realizing this made me smile as I leaned over and fired up the stove for a cup of coffee. With Autumn approaching I camped out under a tarp on a slight incline. I have a fitted sheet for the pad. This particular time I had skipped the sheet. I woke twice to find I had slipped off the pad. I was relieved to find I had the sheet with me went ahead and placed the sheet on. Slept like a log for the rest of the night. In mid October I camped in Weston Bend State Park. Temperature during the day was around 42 F (5.5 C) with a light mist. The temperature dropped to 33 F (0.5 C) that night. 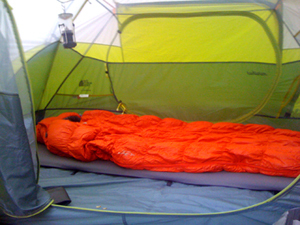 I slept in a three season, two-person tent with of a 15 F (9.5 C) rated, down insulated sleeping bag. 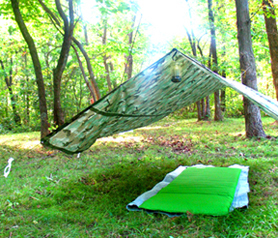 I used an ultralight footprint under the tent and the dedicated sheet with the pad. I slept very well. There was one point in the morning where I noticed I had one foot off the pad, resting on the floor of the tent. Unlike the rest of my body, my foot was pretty cold even though it was in the sleeping bag, with a sock on it. Goes to show how well the pad does around freezing temperatures. 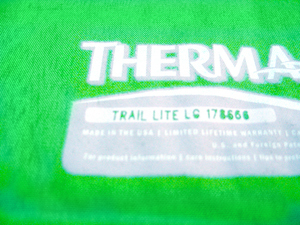 The Therm-a-Rest Trail Lite is a good buy. They do their job and that is important as it provides the necessary protection from the ground which pulls body heat away and the comfort that is needed for a good nights rest that will ensure a more enjoyable trip and a sharper mind. The valve which I had thought as "cheap and unstable" has held up very well and the experience I have had with it debunks my initial impression. I found it difficult to get the pad into the stuff sack the first couple times. A few practices remedied this. Sliding had been a problem one night on an incline when I did not use the sheet. The problem was solved once I placed the sheet onto the pad. I got the pads in April of 2009. As of the writing of this Owner Review I have had a total of 24 nights.